Eugene Hammons, president of the Brenham-area alumni group for the University of Houston, is doing his best to rewrite that tradition by bringing more Cougar red to an area southwest of Houston that’s more commonly colored maroon. By staging fund-raising events and looking for opportunities to talk to groups of college-bound high school students, Hammons and other alumni are sharing a new vision of UH, and Bauer in particular. “I tell them that UH is not just a commuter school, that they don’t turn the lights out at 9 p.m.,” Hammons says. “I tell them that 4,000 students live on campus, that there’s an active sorority and fraternity life and over 100 student organizations on campus. I tell them that if traffic will halfway cooperate, you can reach the central campus from the Brenham area in an hour and 15 minutes, and that the campus is as safe as any other big university campus. As important as all that information is, Brenham-area alumni are also donating generously so that students who choose UH are supported. Megan Andrews, Morgan Parker and Abby deBolt were each awarded a $2,000 scholarship this year. Andrews is a student in the C.T. 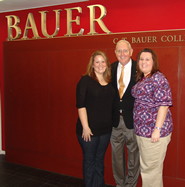 Bauer College of Business. The scholarship she earned is named for Joel M. Cummings Scholarship, a former UH regent and classmate and close friend of Hammons from Brenham who was instrumental in starting the Brenham-area group. Cummings died in 2003 and the fund was named in his honor. Donors have given nearly $14,000 in cash contributions to the scholarship fund in its first two years, with a total of $19,000 in pledges, says Hammons, president of Creekside Investment Management, Inc.